Ok, so it wasn’t exactly “hell”, but as I was being wheeled into the operating room in Careggi for an epidural-anesthetized emergency c-section after being induced with Pitocin, I was wondering whether I hadn’t jinxed myself by blogging that I was open to whatever outcome Peanut’s birth might take. And while I’m sure my “positive thinking” going into the whole thing prevented me from wallowing in self-pity for too long afterwards, it definitely took a few post-partum days before I could start releasing my anger, resentment and sadness over how it all played out. In fact, seven weeks later, I’m still in recovery. The area around my scar remains numb and sore, and I can’t say I’ve gotten over how royally the hospital screwed with my efforts to breastfeed my baby, even though we got lucky despite it all. On one of the few bright sides, and another thought that crossed my mind pre-op on the gurney, was that at least I was having a c-section in the top country in the world for this procedure. Huh. Cold comfort, to say the least. But let me go back to the beginning. I was lucky enough to go into labour naturally, around 6am the day after Peanut’s due date, on August 17. This early phase ended up lasting 24 hours during which time Andrea and I went about doing normal things. I finished watching season 19 of Survivor. Andrea washed the car and installed the car seat. We stopped by his mum’s place and shopped at Esselunga (for groceries) and Media World (for a video camera, not for the birth). 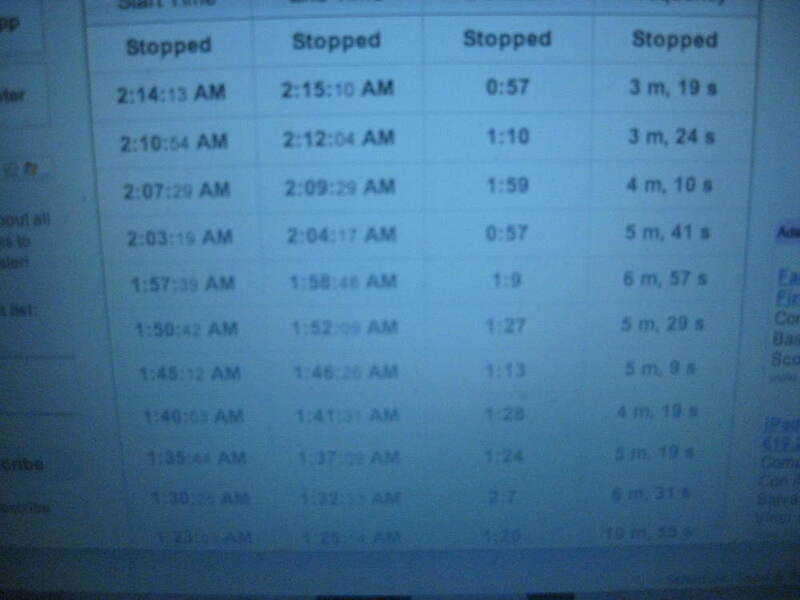 In the late afternoon I started timing my contractions using the handy Contraction Master online, though I had a lot of trouble understanding when exactly they started, and I kept forgetting to start and stop the timer. By 10pm they were coming about 6-7 minutes apart, so I decided to call the birth centre for some direction. They said to wait until they got more intense and closer together, and that at this stage things could still go in either direction. I could be there within hours or it could even stop and not re-start for another day. I really hoped the latter was not going to be the case. I was ready for this to be really it. I was basically calm with a little buzz of excitement beneath my surface, and Andrea seemed to take my cue and feel the same. I went to sleep around 2:30am and by 6am I was woken up by what I knew was the beginning of the real show. While the contractions of the previous 24 hours had felt like mild period cramps, these ones were like the worst ones you can get, the kind I would normally take a pain-reliever for (and I’m not a pill-popper). They made me catch my breath and wince. Being an early mid-August morning, the city felt deserted as we made our way to the hospital, which meant thankfully no traffic. We got there by about 8am. The centre was very quiet with two “midwives” (ostetriche) on call in the central office and no one else about. We found out that the room with the big bed had just freed up - hurray! - and Andrea went back to grab my suitcase from the car while I settled in. One of the midwives offered me breakfast but I had absolutely no appetite. Not even drinking appealed to me in the slightest. And indeed, despite getting down a couple bites and drinking tea and later Gatorade, I kept throwing everything right back up. The contractions were increasing quickly in intensity and for the rest of the day I have a hazy memory of the sequence of events. A few things stand out. I got into the bathtub twice for pain relief, staying in there about an hour each time. As I had imagined, it was the best thing I did, aside from all the breathing, which was also absolutely key. There’s a reason that’s so central to labour preparation! Though I’m not sure I would have done as well or remembered as much to keep up with the breathing if it weren’t for my superstar husband, who was the best coach I could ever have asked for. Every time I started slipping into panic mode over the pain he would get this fierce look on his face, his eyes wide, and get me to stare him in the eyes and breathe deeply. Sometimes it didn’t work, and I would lash out at him moaning/crying, I can’t! and then abandon myself to a full-on wail. But often it did work, even though I’m not quite sure how. But being in the tub in that warm water was incredible. I still felt the pain but somehow it was easier to handle. I was so quiet in there that I even noticed once in my dazed state and through half-lidded eyes that Andrea had fallen asleep on the bed. At around 12:45pm Andrea and I were lying on the bed and he was describing different bodies of water — showers, rivers, oceans — to help me visualize things I find pleasant. Suddenly I felt my own water gushing from me like a collapsed levee! I tried all sorts of positions to get through the pain. Pulling down on the thick rope suspended from the ceiling; getting on my hands and knees and hugging the body pillow; sitting on the toilet; standing with my arms around Andrea’s neck and swaying my hips back and forth. At around 3:30pm the midwives were concerned with my lack of progress. I think at that point I was still only 4 or 5 cm dilated, so they had a gynecologist from Careggi come and examine me. And she made the heartbreaking decision that I needed to be transferred to the hospital. Shortly before this time I was in the bathroom and I distinctly remember thinking then that I was in transition. If you’re familiar with labour you’ll know this is the most excruciating stage. And this is the state I was in as they wheeled me down the hall to my worst nightmare. I noticed the Margherita midwives who had accompanied me exchange looks and say something to him, though I didn’t catch what. I’m not sure if this had anything to do with the amazing thing that happened next, and by then I didn’t care. It turned out that in the process of my transfer I had progressed to such a significant degree that they made the incredible decision to transfer me back to the birth centre! I was overjoyed, hellish pain be damned. I simply couldn’t believe my luck that everything was going to work out after all. When we got back to my wonderful room at the Margherita, one of the midwives said she had noticed me involuntarily push at one point while I had been lying on the bed in Careggi. So they decided that it was time for me to start pushing on purpose. Unfortunately there was some lack of communication, however, and I have since come to understand that from that point on, I did a lot of pushing I shouldn’t have because I was following direction and not my own body. I basically pushed for four hours at the centre before they decided to transfer me back, once again, to the dreaded Careggi, because I had barely progressed any further. Once back in the hospital, I was induced and continued pushing with everything I had in me. I don’t even know where I found the energy at that point. Andrea told me later they were all very impressed (though for all I know he just said that to make me feel better). They did tell me my pushes were great, which was awfully encouraging. Unfortunately it still was not enough to get Peanut out, and after two hours the gynecologist said it was time for her to recommended a c-section. Andrea asked everyone to give us a few minutes alone. Then he looked at me with a mixture of tenderness, resignation and awe. I told him I was ok having the operation and he asked me several times if I was sure, not because he wanted me to keep trying but because he knew better than anyone how important it was for me to give birth naturally. Frankly, after 17 hours of active labour, I was ready to throw up my flag and give up the fight. After that, everything went amazingly fast. I was wheeled into the operating room, where sadly Andrea was not allowed to accompany me, shortly before 11pm, and by 11:37pm Peanut was born. I didn’t even know that he had been pulled out of me until I asked about him and they told me he was already in the other room. Fortunately I didn’t have the presence of mind to wonder why I hadn’t heard him cry. I vomited the little bit of Gatorade that I had finally managed to keep down, and started trembling uncontrollably — a disconcerting common side-effect of the epidural that no one had ever told me about and lasted for about an hour. Shortly before wheeling me out of the operating room, they brought my precious boy to me, for literally about 5 seconds — just enough time for me to kiss him on the forehead before they whisked him away again. “E’ cosi’ bello!” I said. He looked so perfect all bundled up like a little burrito. This is what he looked like the first time I got to meet him properly, in the “sub-intensive” therapy ward a whole 18 hours later, while he was still being kept in an incubator. From what I understand he was in there because he had been given oxygen for two hours after coming out of me. It turns out that he had had the umbilical cord wrapped twice around his neck and once around his ankles, and had experienced some distress either before or during his birth. They ended up keeping him in the ward for 11 days before we finally took him home. I will admit I still don’t understand the details of all the tests they did, but it seemed to me from the start that he was perfectly strong and healthy. I gather that much of it was to be extra cautious. And while I am certainly grateful that he is healthy and that we both received top clinical care, it was at the expense of our all-important initial bonding and proper start to breastfeeding. Not only did my special case result in this depressingly difficult start to nursing, but I even noticed a bottle in the bassinet of a baby born to one of my roommates totally naturally and complication-free! Breastfeeding in Italy will surely be the subject of posts to come, but I am happy to conclude here that after many tears and much frustration and struggle, Peanut is finally and almost miraculously feeding on my milk alone, no thanks whatsoever to our misadventures in the world of fully medicalized birth.